Next departure from La Spezia to Lauterbrunnen is on Tue, 7 May. Approx duration 9h15m. Coaches will pick-up passengers every 2 days. We recommend you stay with Grand Hostel Manin. Rated 94% on Hostelworld. Grand Hostel ManinLa Spezia is strategically located: you can easily reach 5 Terre within few minutes by train, small nice villages on the seaside and beaches (such as Portovenere, Lerici; Tellaro) in 20 min by bus; also Pisa and Genova can be visited in a one day trip ( it takes between 1/1’30 h to get there by tra… read more. The LocationLa Spezia is strategically located: you can easily reach 5 Terre within few minutes by train, small nice villages on the seaside and beaches (such as Portovenere, Lerici; Tellaro) in 15 min by bus; also Pisa and Genova can be visited in a one day trip ( it takes between 1/1’30 h to get there by train) and Florence is about 2,5 hours by train. The hostel is in the heart of the city, walking distance from the train station (10 minutes), the harbour (5 minutes), supermarket, restaurants and pubs. Includes Free Breakfast, Free Internet Access, Free WiFi, Fridge/Freezer, view all facilities. Prices from €21.00 per person. La Spezia is strategically located: you can easily reach 5 Terre within few minutes by train, small nice villages on the seaside and beaches (such as Portovenere, Lerici; Tellaro) in 20 min by bus; also Pisa and Genova can be visited in a one day trip ( it takes between 1/1’30 h to get there by train) and Florence is about 2,5 hours by train. The hostel is in the heart of the city, walking distance from the train station (10 minutes), the harbour (5 minutes), supermarket, restaurants and pubs. Features Free Wifi throughout the property Grand Hostel Manin is a new hostel in La Spezia with many facilities such as free WiFi, Free Breakfast, HD TV, wireless charger, equipped kitchen with big size fridge and freezer, coffee and much more. 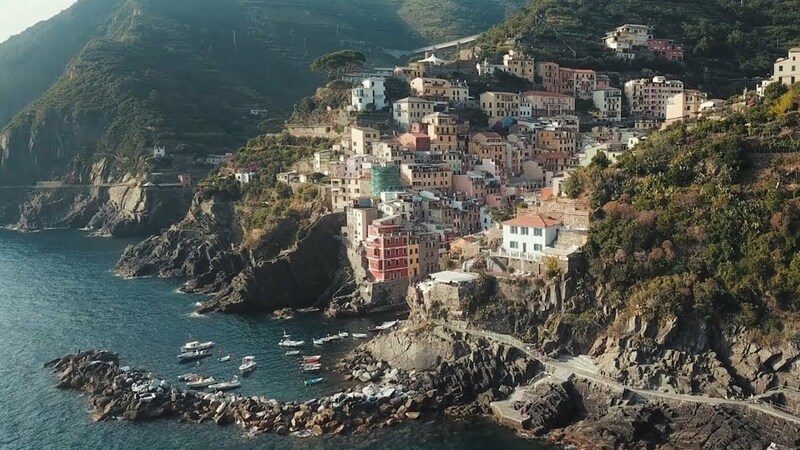 Named after its five tiny villages, the UNESCO-listed Parco Nazionale delle Cinque Terre encompasses some of Italy’s most picturesque and environmentally sensitive coastline. The villages are linked by the 12km Blue Trail (Sentiero Azzurro), a magnificent, mildly challenging 9km (five-hour) trail. The Blue Trail is just one of a network of footpaths and cycle trails that crisscross the park. If water sports are more your thing, you can hire snorkelling gear and kayaks. Visit the five villages: Riomaggiore, Manarola, Corniglia, Vernazza, Monterosso al Mare. Each village has its own character and something unique to offer, from the beaches of Monterosso, to the tiny, clifftop Corniglia, or much photographed Vernazza. The Blue Path The most popular hiking trail along the Cinque Terre, the entire thing will take you about six hours, or you can spread it over several days, with plenty of photo and ice cream breaks in between. Go to the beach! There are numerous beaches in the Cinque Terre region, whether you want to stay close or venture out a bit further. Via dell’Amore The Path of Love is the most famous and romantic stretch of the Cinque Terre coastline, but has been largely closed in recent years since a 2012 landslide injured four tourists. Visit Portovenere This UNESCO heritage listed medieval fishing village on the Gulf of Poets, is a short train, bus or boat ride away from the Cinque Terre and well worth a visit. While Italy abounds with pesto varieties, pesto alla genovese is the most famous. It’s D.O.P. protected, meaning it can only be made in a very precise way, with specific ingredients (including D.O.P. basil from Genoa), to be considered the “real thing.” The ingredients themselves are simple–basil, pine nuts, Parmigiano-Reggiano, Pecorino, garlic, salt, and olive oil—and when it’s done properly, it’s absolutely delicious over penne or another pasta! At the end of a popular beach in Monterosso lies a 14 metre high image of Neptune holding the waves It quickly became the symbol of the town, but allied bombs during WWII and years of rough seas have reduced the once mighty giant to an armless ruin.